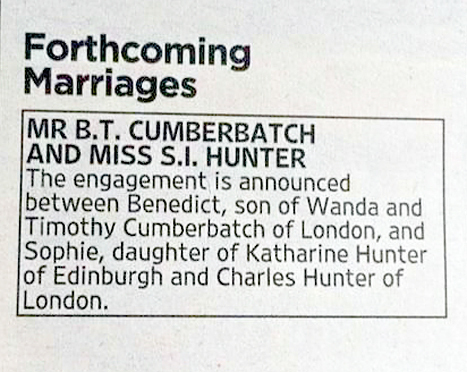 –Benedict Cumberbatch announced his engagement in an adorably old-fashioned way, and all his fans freaked out — and then everyone who’s not a “Cumberbitch” freaked out at the freak outs. I dunno. I’ve never really seen his appeal, but the outpouring of disdain for his fandom today seemed weird. NPR’s Linda Holmes hit the nail on the head with her sports fan analogy. -This doesn’t seem confirmed by any official rep (yet), but Us Weekly is reporting that Jessica Biel is indeed preggers. -Congrats to Robert Downey Jr. and his wife, who announced their new baby girl with a very cute Facebook post. -I’m already watching two shows based on comic books (Arrow & The Flash) and I’m pretty sure that’s my max, but I must admit this Agent Carter preview looks rad. –Christopher Nolan is poo-pooing films that have post-credits scenes, saying “a real movie wouldn’t do that.” As a Ferris Bueller fan, I poo-poo his poo-poo. -This list of every time Buffy The Vampire Slayer made you ugly cry is on point. Every. Single. One. –Lupita Nyong’o is an absolute stunner on the new cover of Glamour. -I always love EW’s annual reunions issue, but this year’s is particularly great. Sports Night! Sisters! Mean Girls! -Here we go again: Marc Anthony is engaged to model Shannon De Lima. -In other couples news: Britney Spears and Charlie Ebersol are now an item. –Adam Brody is set to return to TV and all is now right with the world again. -New diva alert: Sean Avery, who reportedly had a meltdown over a slice of pizza. -Even though the new Annie trailer limits Cameron Diaz‘s screentime, it’s still not very good. -Here’s the first trailer for Chappie, Neill Blomkamp’s latest starring Hugh Jackman.